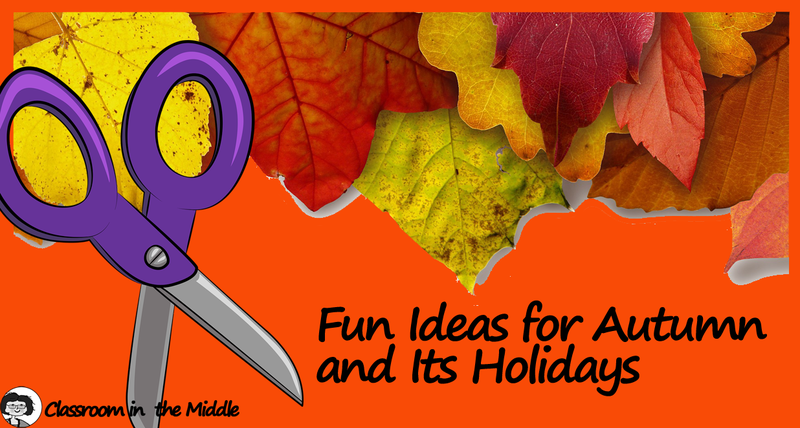 There are so many fun things to do in the classroom in autumn, but sometimes it can be difficult to find just what you want when you are ready to use it. 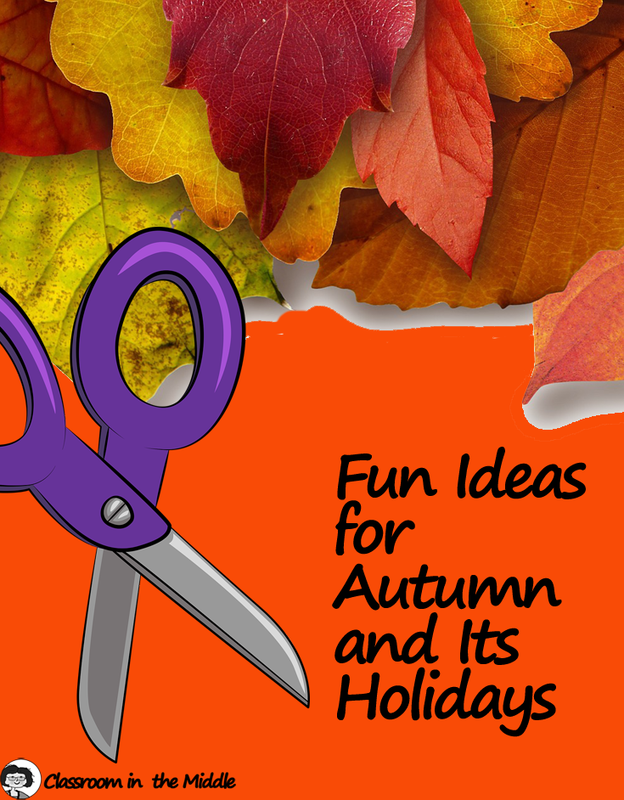 A week or so ago, I posted some autumn ideas especially for language arts teachers, and here I’m collecting more autumn ideas, from a variety of sources, that I thought might be enjoyed by teachers of various subjects in upper elementary and middle school as you plan activities for this season and its holidays. At the links below, you’ll find ideas for fall, Halloween, Day of the Dead, and Thanksgiving. This time, I focused mainly on fun projects for celebrating the season like crafts, art projects, and snacks. Halloween Yarn Garland – Find directions for making a garland of ghosts, spiders, and pumpkins using mainly yard and pipe cleaners in this post from Growing Up Gabel. Looks like a project that the whole class could contribute to, and it would make a nice classroom decoration when completed. Pumpkin Rice Krispie Treats – Find the directions for these sweet treats, along with lots of other Halloween foods, in the post 42 Creative Halloween Foods from One Little Project at a Time. The sugar cookie spiders are pretty cute, too. Boo! Pop-up Cards – In this post, Pazzles Craft Room shows how to make a basic pop-up card, and includes examples of one with pumpkins and one with a ghost. Native American Sand Art Arrowhead Necklace – Free Kids Crafts provides the directions for making this arrowhead necklace from simple materials including cardboard, sand, jute, and a few beads. 7 Thanksgiving Books for Kids from a Native American Perspective – I thought this post from Cool Mom Picks was definitely a good one to save, since titles from a particular perspective can be difficult to find on short notice. Fun Kid Crafts for Day of the Dead – More ideas for holiday crafts using simple materials like stones and clay, from The Crafty Crow. Pumpkin Seed Mosaics – Recycle those seeds into a fun autumn craft with the directions in this post from Kinder Art. 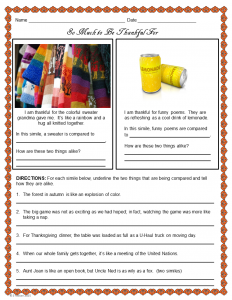 Two FREE Autumn Resources from my store – I can’t finish this post without including links to free resources that I’ve created for my store to celebrate fall, Halloween,and Thanksgiving. Click on each image to follow the link and download the free resource now. 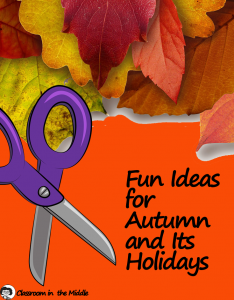 You can find all of these ideas and more in one place – my Autumn and Autumn Holidays Pinterest collection; I’ll be adding more resources as I find them. Follow me on Pinterest if you like! 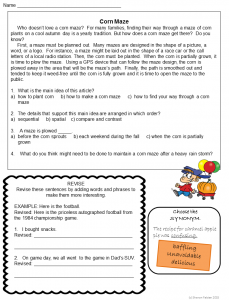 And here is the link to my previous post with more autumn ideas, Autumn Activities – Five Fall Ideas for Language Arts Teachers. If you have some great fall finds that you would like to share, I’d love to hear about them in the comments below!